Whenever we experience heatwaves or cold snaps, droughts or floods, people want to know: was this due to climate change? And until about a decade ago the response was: we don’t know. We can’t link specific extreme weather events to climate change. Now things have changed. While we can’t say climate change caused an extreme event, we can estimate how much more or less likely the event has become due to human influences on the climate. This relatively new and rapidly developing area of science is called “Event Attribution” and it was the subject of a recent US National Academy of Science report . The report finds that event attribution allows us to quantify the role that humans have had on some specific extremes. But, it also challenges scientists to better evaluate our methods and communicate the results we get. Australian climate scientists have been leading the way in event attribution and are at the forefront of new developments in the field. In part, this is because Australia is already experiencing a rapidly changing climate with many extreme events occurring in the last few years. We have assessed the role of human-forced climate change and natural variability (related to El Niño and La Niña) in a range of recent extreme events including the heavy rains of 2011/12, the “Angry Summer” of 2013, and the heatwaves and droughts of the last three years. Just last week, an Australian-led study was published which took a different approach to highlight how human activities have been influencing heat extremes for decades - all the way back to 1937 in the case of global-average temperature records. We have more tools than ever before that allow us to distinguish the roles of human-induced change and natural variability in different extreme events. In addition to our climate observations, we have a growing number of climate model experiments at our disposal including the Weather@Home model, which generates thousands of years worth of data, so we can make robust estimates of our impact on extreme weather events. We are also able to look at the role of climate change on extremes as the event is happening or immediately after it’s finished. We are using a wider range of methods to investigate the human role in extreme events based on observations and model simulations. As part of the World Weather Attribution group organised by Climate Central in the US, we have taken a variety of different approaches to examine the role of climate change in the record warm Central England temperatures of 2014 and the 2014-2015 drought in south-east Brazil. We have made a lot of progress in assessing and quantifying the role that climate change has played in some of the recent extreme events we have experienced in Australia and worldwide but a number of challenges remain. We need to better understand how and why the occurrence of extreme events is changing. For example, Melbourne has had a number of hot spells this summer. We know that hot days in Melbourne are becoming more frequent, but we don’t yet fully understand why. Is it because the background state of the atmosphere is warmer or are the weather systems that bring hot weather to Melbourne (usually northwesterly winds ahead of a cold front) becoming more frequent or more intense? We need to investigate more thoroughly the effects we’re having on our extreme weather. 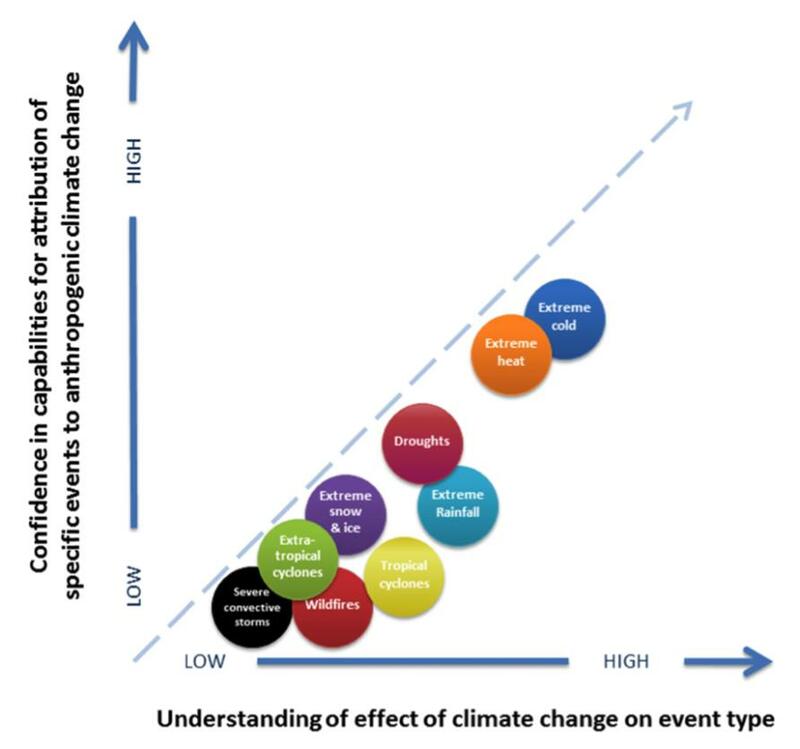 There are also many types of extreme weather event where we struggle to assess the role of climate change. These include events that occur on very small scales, such as hailstorms and tornadoes. Understanding the human influence on these kinds of high impact severe weather is beyond our current capabilities due to their rare occurrence and the difficulties in modelling them at the spatial scales they occur on. Tropical cyclones also represent a significant challenge as some model setups have trouble accurately simulating their frequency and intensity. However we do know that human activities have exacerbated the impacts of tropical cyclones through sea level rise causing larger storm surges. Event attribution is a rapidly advancing area of science. We are making good progress in Australia and worldwide with improving our knowledge of the changing patterns of extreme events. But more needs to be done so we can better understand how our climate is being altered by our activities. This will allow us to plan for future extreme weather events and reduce their potentially devastating impacts on society. Banner image: Lightning storm, Port-la-Nouvelle. Picture: Maxime Raynal/Wikimedia.